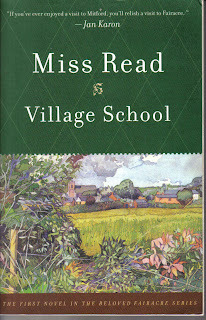 I am in the process of reading my ninth book by Miss Read (who is actually Dora Saint). They are my very favorite kind of book. Set in little villages in England, they are simple stories about the lives of the characters who populate Fairacre and Thrush Green. Each village has its own separate series. They are equally delightful reading. In fact, they are the sort of books that once deeply involved in them you find yourself astonished, when you chance to look up from the pages, to find that you are in your own living room - not walking the streets of a tiny English village. "And all the time, I told them, the world is going round and round, like this!' I twirled the globe vigorously, with one finger on the Russian Steppes. 'Which accounts for the night and the day,' I added. I regretted this remark as soon as I saw the bewildered faces before me, for this meant a further lesson, and one, as I knew from bitter experience, that was always difficult. 'How d'you mean - night and day?' came the inevitable query. I looked at the clock. Ten minutes before the dinner van was due to arrive - I launched into the deep. 'England moves away?' hazarded one groping soul. 'Well, who's got the sun now?' asked someone who was really getting the hang of this mystery. 'Australia, New Zealand, all the countries on this side of the globe. Then as the world turns, they gradually revolve back into darkness and we come round again. And so on!' I twisted the globe merrily, and they watched it spin with silent satisfaction. 'You know,' said John at last, summing up the wonder succinctly, 'someone thought that out pretty good!" Oh, I love these stories. Forgive me for foisting my enthusiasm on you. I just had to share! Yes, someone thought that out pretty good! I have not hear of these books. Thanks for sharing! Now that looks like a book I want to look in to, thankyou. Linda...I'm reading this book, too!!! I read that part a few days ago and absolutely loved it! This is my first time reading any of Miss Read's book, and I find her writing absolutely delightful! I love these too, and have read quite a few of them; they are nice 'cozy' reading. going to look for these, thanks Linda! Reading outdoors with the beautiful sights and sounds of springtime sounds like my kind of afternoon. This book sounds delightful! Thanks for piquing my interest, Linda! I've read the Thrush Green books and I LOVE them!